Stay with us in June Lake for a small town vacation experience in the scenic High Sierra Mountains. June Lake is located in the heart of the High Sierra Nevada mountains and is surrounded by the Inyo National Forest, alpine lakes and monster trout. We also have exceptional hiking and mountain bike trails, and the perfect small-town ski mountain that rises to 10,000 feet. June Lake has the greatest reasons to come back year after year with your family or small group. You will love June Lake, and that begins with our comfortable and accommodating inventory of vacation condos, vacation homes and cabins. Call us as soon as you have any questions. (855) 648-5863. We cannot wait to hear from you. See you soon! Historic A-Frame vacation cabins with the Inyo National Forest off the back deck. Open year round, Lake Front Cabins has ten cabin style units in a warm friendly atmosphere. 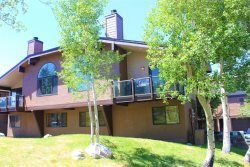 Located 500 from the waters edge, across the street from June Lake, next door to the June Lake Marina. In the June Lake Loop, you can walk to the Villages shops, restaurants and stores, Gull Lake and of course, June Lake.